The last several years have been marked by the abrupt end of decades of gradual liberalisation of restrictions on the movement of goods, people, and firms. In the US, the new administration has imposed tariffs on Chinese goods and taken steps to make it more expensive for US firms to expand overseas. In the UK, the decision to leave the EU is likely to have widespread implications for the economic structure of Europe and has induced multinational firms to rethink their global production strategies. Growing scepticism in many other countries also suggests that harder borders may be erected to make trade and foreign investment more difficult. An understanding of the welfare implications of new restrictions on trade and international investment requires careful general equilibrium modelling. This is especially true in a modern economy in which firms fragment their production processes so that different activities can be located in different countries. A well-known result in basic trade theory is that efforts to protect an activity in which a country has a comparative disadvantage may have the unintended consequence of discouraging activity in which the country has a comparative advantage. Perhaps a less well appreciated result from basic trade theory is that trade and investment restrictions, such as those that happen upon the breakup of a trading bloc, may reduce the effective size of a market and lower aggregate productivity in the presence of increasing returns to scale (Redding and Venables 2004). In new research (Arkolakis et al, 2018), we present a rich quantitative model that can be used to analyse the welfare effects of recent policy reversals. The model is designed to focus on two key activities that occur within global value chains: an innovation activity (e.g. R&D) in which goods such as pharmaceuticals are invented using an increasing returns to scale technology; and a production activity (e.g. manufacturing) that uses the new blueprints and other inputs to produce goods. Critically, these activities can be geographically separated and new technologies can be used for production in multiple locations simultaneously. One key force at work in our model is comparative advantage. Some countries have a comparative advantage in innovation while others have a comparative advantage in production, and we expect countries to specialise in innovation or production accordingly. Another force at work in the model is what is known in the trade literature as the home market effect. This effect tends to drive activities with increasing returns – here, the innovation activity – towards countries that enjoy access to large markets. Whatever the source of a country’s specialisation in either innovation or production, the model highlights the role of trade in intangibles as the source of observed merchandise trade imbalances. Countries that are innovation hubs run trade deficits as the value of the goods they produce is less than the value of the goods that they consume. This deficit is paid for by a source of income that does not appear in the merchandise trade account. This income is repatriated multinational profit flows, which are the return to innovation. In contrast, countries that are production hubs run trade surpluses – their net exports of goods pay for their net imports of ideas. We combine our model with data on international trade and multinational production to identify the web of cross-border trade and investment frictions that drive the location of global innovation and production. We illustrate our findings through some examples. We find that the US and the Scandinavian countries are specialised in innovation, but for different reasons – while the Scandinavian countries have a comparative advantage in innovation, the US has an advantage in innovation over production activities because of its large size, which favours increasing returns-to-scale activities. If the US were smaller, it would specialise in production rather than innovation. On the other hand, Canada and Mexico specialise in production because of their geographic position, in particular their geographic proximity to the US, while China specialises in production in spite of its large size because of a comparative advantage in production. Our framework also has implications for within-country inequality. A policy change can negatively affect aggregate real income while benefiting a substantial part of a country’s population. We embed a Roy (1951) model into our quantitative framework to investigate the impact of policy changes on the real income of agents linked to production activities versus those linked to innovation activities. In this environment, policies that impose new restrictions on outward multinational production will depress innovation and hurt workers in innovation relative to those engaged in production. More generally, policies will have relative income effects that depend on whether they expand or contract innovation relative to production. Motivated by Brexit, we use our model to quantify the effects of an increase in both trade and foreign investment frictions between the UK and other countries in the EU. 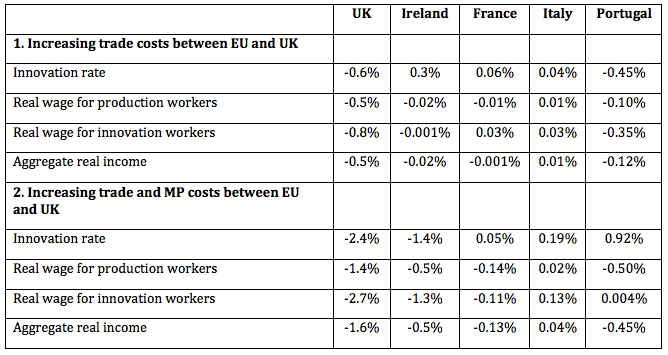 As Table 1 shows, we find that while only increasing barriers to trade by 5% with the EU would reduce real income in the UK by more than half a percent, also increasingbarriers to foreign investment by 5% would more than triple the real income losses. The share of innovation in UK’s GDP would fall by almost 2.5 percentage points, and workers engaged in production and innovation would experience decreases in their real wage of 1.4% and 2.7%, respectively. All EU members, except for Italy, would experience aggregate welfare losses from Brexit, with Ireland experiencing the highest losses. In most EU countries, both innovation and production workers would lose, except for Italy and innovation workers in countries such as Portugal. While the increase in innovation rates in Italy is large enough to create aggregate gains, that is not the case for France. Notes: 1. Increase in trade costs of the UK to/from the EU by 5%. 2. Increase in trade costs and multinational production (MP) of the UK to/from the EU by 5%. Next, we imagine different scenarios in which the reversal of NAFTA may occur. First, we assume that trade costs of shipping goods from Mexico into the US increase by 35%. In the second scenario, we assume that, in addition to the increased trade costs, foreign investment frictions increase by 20% for US firms that open production facilities in Mexico. Finally, we consider an alternative shock in which costs to move abroad for US firms increase by 20% for US firms. Table 2 summarises the results. Notes: 1. Increase in trade costs from Mexico into the US by 35%. 2. Increase in trade costs from Mexico into the US by 35%, and of investment from the US in Mexico by 20%. 3. Increase in investment costs from the US abroad by 20%. In all cases, US national welfare would decrease and the real income of both innovation and production workers would fall, with the overall aggregate real income falling by 3% in the third scenario. 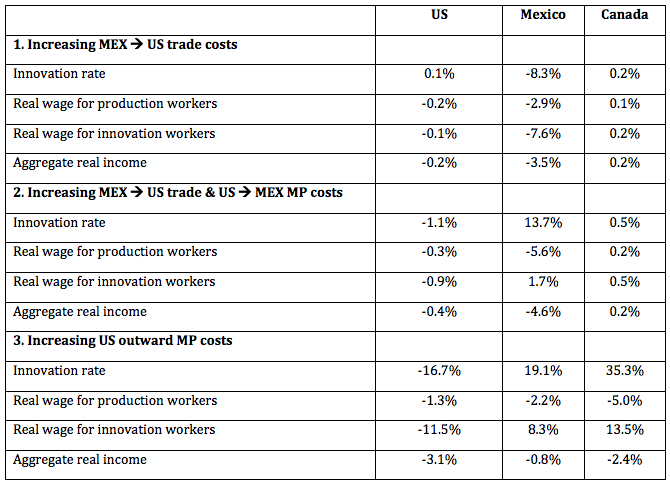 Similar negative effects, but much larger, would be observed for Mexico, except for innovation workers who would benefit substantially if US firms had a harder time to move production across the border. For scenarios 1 and 2, everybody in Canada would be slightly better off. But restraining the movement overseas of US firms would negatively affect aggregate Canadian welfare as well as their production workers. In a world of internationally fragmented production, one country’s decision to impose barriers to trade and investment has large, heterogeneous effects on welfare around the world. We characterize these effects in the simplest quantitative setting that contains some of the key economic mechanisms in the theoretical literature. We hope our framework will be adapted to encompass the diverse, and complicated value chains that are the hallmarks of modern globalization. Arkolakis, C, N Ramondo, A Rodríguez-Clare and S R Yeaple(2018), “Innovation and Production in the Global Economy”, American Economic Review 108(8): 2128-73. Redding, S and A J Venables(2004), "Economic geography and international inequality", Journal of International Economics 62(1): 53-82. Roy, A D(1951), “Some thoughts on the distribution of earnings”, Oxford Economic Papers 3(2): 135-146.